To establish the new parks, laws passed by the National Congress in November were enacted by President Cristina Fernandez de Kirchner in December 2012. The new marine parks – Isla Pingüino Coastal Marine Park and Makenke Coastal Marine Park – were applauded this week by the Wildlife Conservation Society, based at New York’s Brox Zoo, which worked with Argentine officials to create the new parks. Stretching 80 miles south of the town of Puerto Deseado and extending 12 miles out to sea, Isla Pingüino, or Penguin Island, covers nearly 1,800 square kilometers (720 square miles) of ocean and coastline bordered by cliffs. 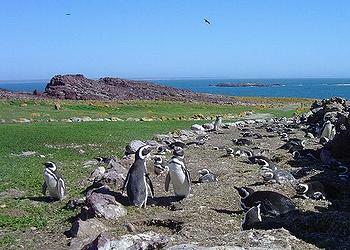 Isla Pingüino is inhabited by one of the only colonies of rockhopper penguins on the Patagonian coast. The newly protected area contains large populations of South American sea lions, red-legged cormorants, and one of the largest colonies of imperial cormorants found anywhere, with more than 8,000 breeding pairs. Farther south, the Makenke Coastal Marine Park begins at the entrance of the Ria San Julian, covering almost 600 square kilometers (230 square miles) of shore and ocean. This park contains the largest colony of rare red-legged cormorants in the country. 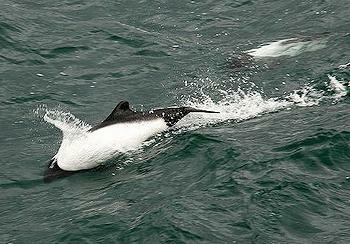 It also protects breeding colonies of the dolphin gull, a rare scavenger, and pods of black and white Commerson’s dolphin. Charles Darwin traveled to the region now contained in Isla Pingüino in 1833, describing the wildlife he observed there during his voyage aboard the HMS Beagle. Makenke Coastal Marine Park borders the inlet of San Julian, where in 1520 Ferdinand Magellan executed a group of mutineers who disrupted his voyage, the historic first circumnavigation of the globe. Both the Isla Pingüino and Makenke Coastal Marine Parks resulted from work conducted by Dr. Patricia Gandini, president of Argentina’s National Parks Service, and Dr. Esteban Frere of the Universidad Nacional de la Patagonia Austral. Both biologists began studying the wildlife of coastal Santa Cruz in 1985 with support from the Wildlife Conservation Society. These areas were identified as priority conservation sites by the Patagonia Coastal Zone Management Plan project, carried out by the Wildlife Conservation Society and the Fundacion Patagonia Natural with support from the Global Environmental Facility and the United Nations Development Program. Support for the research was also provided by the Consejo Nacional de Investigaciones Científicas y Técnicas. The officials charged with managing the parks will seek to promote “sustainable activities compatible with conservation area” and “awareness of the importance of conservation area for users of the same and the inhabitants of the region, through the interpretation and environmental education,” states the decrees establishing the parks. Each park will be overseen by an Executive Management Committee that includes both national and provincial officials, and in the case of Makenke, a local official as well. For Makenke, the Management Executive Committee will select an advisory board of representatives of rural landowners adjacent to the park, as well as park inhabitants, nongovernmental environmental organizations, technical and scientific organizations and municipalities in the vicinity.